Are there missing links between ancient primates and modern humans? One of the issues most frequently raised by both creationist and and intelligent design writers is the question of gaps in the fossil record, and, in particular, of "missing links" between "apes" and humans. In one sense, such a question is improperly posed -- science does not propose that a modern "ape" (gorilla, bonobo or chimpanzee) changed into a human, either quickly or slowly, but instead that gorillas, bonobos, chimpanzees and humans all had a common primate ancestor, probably about 10 million years ago. In any event, the question of whether there are "missing links" between ancient primates and humans is now rather pointless, given the many fossils that have been discovered, representing numerous different species. The only real questions here are how all of these ancient fossils fit in the family tree, which are in the direct line of human ancestry, and how many more species are still to be found. To appreciate how far the study of prehuman fossils has come, even in the 1990s it was generally thought that the first hominins (the group that includes modern humans and their extinct predecessors) appeared about four million years ago, and then descended in a fairly "linear" fashion to Homo ancestors who left Africa about one million years ago, some of which subsequently became the Neanderthals, a relatively brutish and not-very-smart species who were, in turn, replaced by Homo sapiens about 30,000-50,000 years ago. But we now know that this picture was too simplistic, and even downright wrong in some particulars. For example, researchers now recognize that Neanderthals were actually quite sophisticated. The full history of prehuman species is significantly more complicated, with numerous branches that may or may not have led to modern humans. What's more, emerging evidence has shown that there were more of our "cousins" living on the planet at the time of Neanderthals. A branch known as Denisovans has been discovered that, based on DNA analysis, is distinct from both human and Neanderthal lineage, yet some of its DNA lives on today in human DNA. Yet another branch is Homo floresiensis, popularly known as the "hobbit" fossil, which may have survived until as recently as 66,000 BCE (see Prehuman fossils and Controversies for additional details). If the full detail of this graphic is not visible, you can view it directly (and magnify it, using your browser's magnifying facility) here. It can also be seen in [Tattersall2012, pg. 12]. Indeed, Tattersall's book presents a very detailed analysis of prehuman fossils that were known at the time of its publication (2012). In the above table, the column headers denote different creationist publications -- see [Cuozzo1988; Gish1985; Mehlert1996; Bowden1981; Gish1979; Menton1988; Taylor1992; Baker1976; Taylor1995; Lubenow2004; Taylor1996; Line2005]. In the second column, the "cc" figures denote the size of the brain cavity in cubic centimeters. The utter disagreement in this table as to whether fossils are "ape" or "human" is moot testimony to the fact that there is no clear delineation -- all are related in a family tree. As biologist Kenneth Miller observes, "Ironically, validation of our common ancestry with other primates comes directly from those [creationists] who are most critical of the idea." [Miller2008, pg. 95]. The "Ardi" fossil. In 2009, a team of researchers led by Tim White of U.C. Berkeley published their finding of a rather complete fossil skeleton named Ardipithecus ramidus, or Ardi, which was dated to 4.4 million years ago. This is more than one million years older than Lucy, the famous skeleton of the species Australopithecus afarensis [Wilford2009]. White's team concluded that the skeleton was likely in the path that led to modern humans. However, in May 2010, another team, led by Thure Cerling of the University of Utah, questioned this conclusion, noting that an analysis of soils and silica in the area surrounding the find indicated a tree-savana or bush-savana environment (and thus not a likely habitat for hominins) [Wilford2010]. White's team testily replied that the Cerling team ignored "the totality of the fossil, geological and geochemical evidence" presented it the original papers, including, the abundant presence of fossilized mammals adapted to wooded life. This fact, according to White, established that Ardi lived in "closed habitats," not in open savanna and thus was plausibly a human ancestor [Wilford2010]. Denisovan fossil. In March 2010, Paabo and his team announced the discovery of a new branch of hominin, identified as the result of analyzing mitochondrial DNA (mtDNA) from a finger bone found in the Denisova region of Siberia. This species co-existed with humans until as recently as 50,000 years ago, yet is roughly twice as distant (measured in terms of the time since a common ancestor) from modern humans as Neanderthals [Wong2010a]. A follow-up study published in December 2010, based on an entire genome sequence of the specimen, found that not only do the Denisovans represent a "sister" species to Neanderthals, but that in fact this race of prehumans evidently interbred with Southeast Asian humans, since the genomes of modern-day New Guinea natives contain 4.8% Denisovan DNA [Zimmer2010a]. What's more, an additional study published in August 2011 noted that interbreeding with Neanderthals and Denisovans actually boosted human immunity to viruses [McGrath2011]. New South African fossil. One of the most dramatic discoveries of the past few years is the April 2010 announcement, by Lee Berger of South Africa, of a new hominin species, named "Australopithecus sediba," based on some unusually well-preserved South African fossils, including one near-complete skull, which were discovered in 2008 by Lee Berger and his nine-year-old son. These specimens lived approximately 1.977 million years ago, during the era when both australopithecines and early species of Homo existed. Berger and his colleagues of the University of the Witwatersrand in Johannesburg, suggest that this species descended from Australopithecus africanus, but is ancestral to Homo erectus, which in turn is widely believed to be the ancestor of Homo sapiens [Wong2010b; Wade2011c]. However, as with the Ardi skeleton mentioned above, other paleontologists are not so sure. Meave Leakey of the National Museums of Kenya, for example, does not think that this species is ancestral to Homo or has anything to do with Homo. Similarly, anthropologist Berrnard Wood places little credence in Berger's claim that their specimen is a direct ancestor of humans. Additional studies will be required to resolve this question [Wong2012]. Lucy's great-grandfather. In June 2010, a team of anthropologists led by Yohannes Haile-Selassie, Director of Anthropology at the Cleveland Museum of Natural History, found fossilized bones of a specimen they nick-named "Kadanuumuu," which is Afar for "Big Man." The specimen is 3.58 million years old, which is more than 400,000 years older than the famous "Lucy" specimen, and thus has been dubbed by some "Lucy's great-grandfather." Among other things, this specimen walked upright on two feet, thus establishing that bipedalism was fully established among ancestral species at least 3.58 million years ago [Dalton2010]. Qesem Cave (Israel) fossil. In December 2010, a team of researchers led by Israel Hershkovitz of Tel Aviv University published results on the analysis of some teeth found at the Qesem Cave site in Israel. These teeth were dated to between 200,000 BCE and 400,000 BCE. Researchers who analyzed these teeth, using techniques such as CT scans and X-rays, found that they are very similar to human teeth. Thus, if substantiated, these may be some of the oldest truly human artifacts. 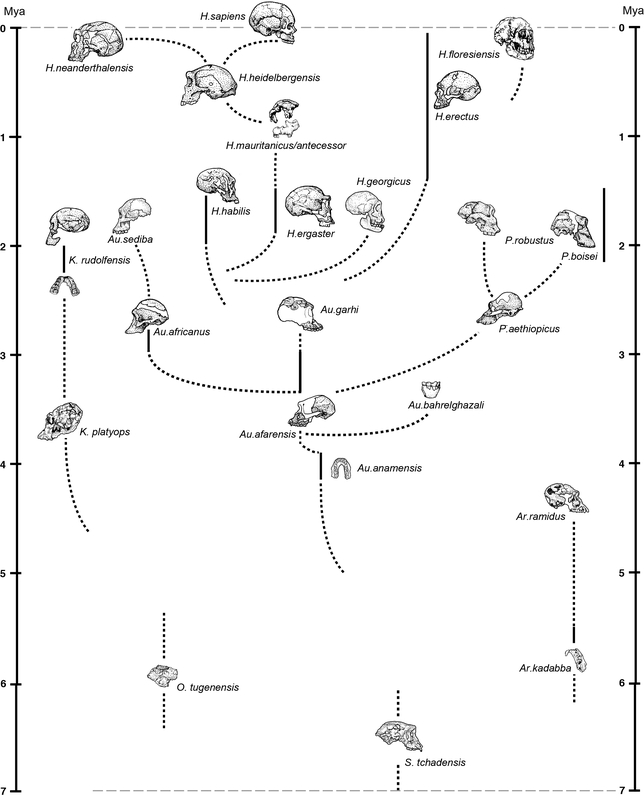 However, they also exhibit some affinities with Neanderthal specimens, and thus may represent some common ancestor (such as the Denisovan species) prior to the time when humans and Neanderthals split [SD2010h; Hershkovitz2010]. Multiple species living together. In August 2012, famed mother-daughter paleontologists Meave and Louise Leakey announced the discovery of additional fossil fragments 1.83 to 1.95 million years ago, which confirm that there were at least two contemporary Homo species, in addition to Homo erectus, living in East Africa at that time. Paleontologists Ian Tattersall noted that this finding "supports the view that the early history of Homo involved vigorous experimentation with the biological and behavioral potential of the new genus, instead of a slow process of refinement in a central lineage" [Wilford2012a]. New skull features "mosaic" of features. In October 2013, researchers led by Georgian anthropologist David Lordkipanidze found the most complete jaw and cranium from the period, namely 1.8 million years ago, which, as noted in the previous item, is thought to be a critical time in prehuman history. This skull appears to represent a "mosaic" or mixture of features seen in early prehuman skulls and more recent prehuman skulls, and thus raises the question as to whether the several species thought to exist at the time were simply different varieties of a single species. Either way, German anthropologist Fred Spoor agrees that this is "an absolutely fabulous specimen" [Switek2013]. Oldest prehuman DNA. In a surprising new development, announced in December 2013, researchers at the Max Planck Institute retrieved DNA from an ancient hominin fossil 400,000 years old found in Spain. It is easily the oldest specimen ever to have its DNA analyzed. These researchers had expected the specimen to be a forerunner of Neanderthals, but its DNA more closely resembles that of the Denisovan lineage, mentioned above. This raises the possibility that the Spanish specimen might belong to yet another branch of ancient prehumans, or even the remnant of Homo Erectus, which originated roughly 1.8 million years ago but was thought to be extinct more recently. Either way, researchers are puzzled and excited by the new discovery [Callaway2013b; Zimmer2013b]. For additional discussion of DNA evidence for evolution, see DNA. Complete Neanderthal genome from a toe bone. In December 2013, a team of researchers led by Svante Paabo of the Max Planck Institute for Evolutionary Anthropology in Leipzig, Germany announced that they had extracted the entire genome of a 130,000-year-old Neanderthal from a single toe bone found in a cave in Siberia. Sarah Tishkoff of the University of Pennsylvania commented on this development by saying, "Twenty years ago, I would have thought this would never be possible." This data, together with other recent studies, has established that humans, Denisovans (see previous item) and Neanderthals represent three different branches on a common tree that diverged roughly 600,000 years ago, but that there has been significant genetic sharing through interbreeding since then [Zimmer2013c]. Controversy over hominin fossils. In April 2014, a controversy arose when two researchers at Tel Aviv University in Israel argued that fossil specimens unearthed in 2010 and named "Australopithecus sediba," actually are from two completely different hominin species. However, the discoverers of the Australopithecus sediba fossils are not convinced, and additional studies will be required to sort this out [Wong2014a]. The "hobbit" fossils. The 2003 discovery of Homo floresiensis, better known as the "hobbit," on the island of Flores in the Indian Ocean north of Australia, has precipitated considerable controversy, which debates continue to the present day. Some researchers argue that the hobbit represents a distinct hominin species, as shown in Tattersall's graphic above, that somehow survived until as recently as 66,000 BCE, but others remain unconvinced [Callaway2009; Flores2010]. In November 2015, Japanese researchers found, after a thorough analysis of hobbit teeth, that the specimens had numerous dental traits not typical of any human (or any other known hominin), but relatively close to those of Homo erectus [Choi2015]. This was followed in April 2016, when Canadian researchers found that the hobbits lived from 66,000 to 87,000 years ago, not 18,000 as originally claimed, which rules out the possibility that these are human (since humans did not arrive on the island until 50,000 years ago) [Gramling2016]. Then in June 2016, Australian researchers announced the discovery of additional Homo floresiensis fossils, some as old as 700,000 years, further establishing that these were a distinct lineage [Zimmer2016a]. Some additional details on the Homo floresiensis debate are given at Controversies. 3.3 million-year-old tools in Kenya. In May 2015, a team led by Sonia Harmand of Stony Brook University reported finding tools at a site in Kenya that are estimated to be 3.3 million years old, the oldest date so far for any hominin tools. The researchers believe these tools were made by a species known as Kenyanthropus platyops [Wilford2015a]. New prehuman species contemporary with Lucy. In May 2015 a team led by Yohannes Haile-Selassie of the Cleveland Museum of Natural History announced the discovery of a jaw in Ethiopia that belonged to a distinct prehuman species that lived between 3.3 and 3.5 million years ago. They dubbed the species Astralopithecus deyiremeda. As paleoanthropologist Carl Ward of the University of Missouri explained, "I'm so excited about these discoveries, I'm driving my friends crazy." [Zimmer2015b]. New prehuman species "Homo naledi" found in South Africa. In September 2015, a research team led by Lee Berger, who discovered the Australopithecus sediba fossils mentioned above, announced that they have uncovered a treasure-trove of fossils from a new hominin species, which they have named "Homo naledi." To date they have catalogued 1,550 individual fossil elements, which is by far the largest number of hominin fossil fragments ever found at a single site. These fossil elements represent parts of at least 15 individuals, and some of these skeletons are nearly complete. This amazing find is in stark contrast to most hominin fossil finds, where little more than a handful of isolated fragments from a single individual are identified. The researchers are as mystified as anyone as to how and why these human remains were placed in this remote chamber of the cave, which required extra-slim investigators (all of them women) to reach [Wilford2015b]. Originally Berger estimated the fossils to be 2-3 million years old, but more recently he announced that they are only about 250,000 years old, which is even more interesting, because it means that another distinct hominin species was on the Earth coincident with nearly modern humans [Barras2017]. Although these and other findings have destroyed the previously held scientific notion of a neat, linear descent through a sequence of well-defined ancient hominin species, they have also utterly destroyed the creationist view that there are no "missing links." Will we ever have a complete picture of these hominin species? Probably not. As Carol Ward of the University of Missouri School of Medicine noted in the February 2013 issue of Scientific American, "What we're glimpsing in the fossil record is but a flicker of the ancient diversity." Jeremy DeSilva of Boston University added that the last common ancestor between, say, humans and chimps, or between humans and the Ardi species, is unlikely to be a single individual, but instead will be a population. "Knowing whether you have the common ancestor without DNA is going to be difficult." [Harmon2013]. In summary, there is no truth to the claim by creationists and others that there are huge gaps (i.e., "missing links") between ancient apes and humans. If anything, there is an embarrassment of riches. So many specimens have been found in the past decade or two that the only challenge is clearly establishing their positions in the family tree, i.e., deciding which are distinct species and which are simply varieties of a single species, and which are truly in the direct line that leads to modern humans and which are evolutionary dead ends. Thus claims of "missing links" or "gaps" are only valid in the sense that when one transitional fossil is found, this creates two more "gaps" -- one on each side of the new fossil! What's more, as can be readily seen from the examples mentioned above, those writers who still advance the "missing link" or "gap" line to criticize evolution cannot take refuge in ignorance. Most of the recent hominin fossil findings have been widely publicized, not only in scientific journals, but also in news sources such as The New York Times, Scientific American, National Geographic and New Scientist, which are available at many grocery stores and also online. Even a quick Internet search yields numerous easily accessible and very readable articles on these discoveries. We should celebrate, not resist, these findings, since they underscore how singular and successful our species has been. And there are many intriguing questions that still beg to be answered -- e.g., What specific features (anatomical, mental and cultural) did humans develop that others did not? Which of these features led to our survival and ultimate dominance? What "echoes" of our earlier existence can we see in our anatomy, genetic profile and archaeological history? These are active areas of scientific research, and hopefully some answers will be uncovered in the coming years. For additional discussion, see Fossils and God of the gaps.